Another South African, this shrubby salvia has been around Australia for 20-30 years. It is a hardy evergreen for drought or whatever you wish to give it. It seemed to originally be called Africana aurea and some people are going back to that but I believe it is incorrect. Lutea means yellow so it is descriptive.The opening buds look yellow. 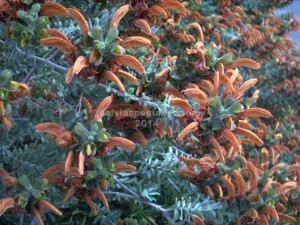 It has unusual large rusty coloured flowers mainly winter/spring. The colour has led to one visitor asking me was it dead! The greyish foliage looks very much like saltbush so it fits in well with Australian native gardens. Average size is probably close to 2m but it can get taller and wide to a metre or two. 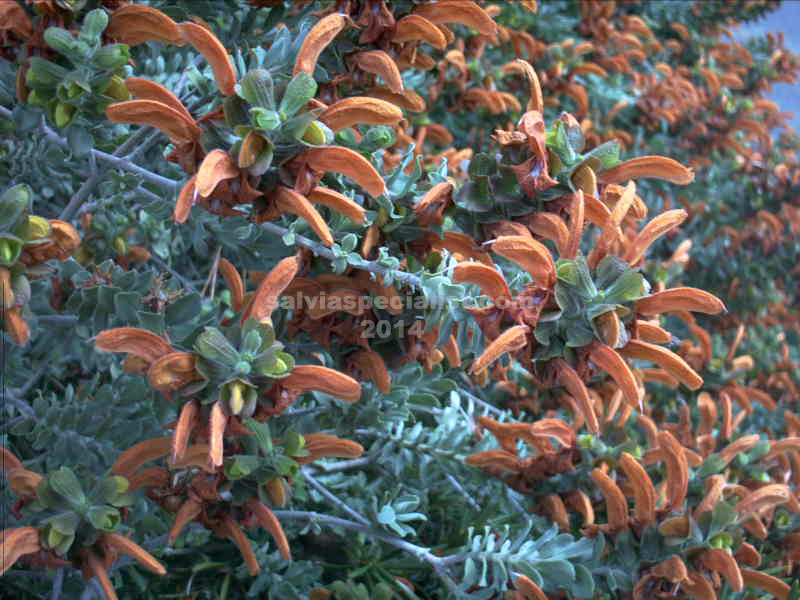 The rusty calyces inflate after the flowers fall and are themselves very showy for a long time. It sets seed for me. The year after we had bad bush fires and smoke in our street I had a lot of self seedlings which I don’t usually have but maybe could have in different conditions. Seedlings can vary in appearance and behaviour. One that is circulating seems to be more compact and shorter, with green calyces. Very young plants can frost burn below -2C. Older plants should be tough.